During the ITU World Radiocommunication Conference 2015 (WRC-15) to be held from 2nd to November 27th 2015, an ARISS contact was realized on Tuesday, November 3rd, 2015. Students from Institut Florimont were able to use the ITU station to talk to astronauts Kjell Lindgren KO5MOS (in front) and Kimiya Yui KG5BPH (in QSO with 4U1WRC), who were using the amateur radio station in the ISS Columbus module, call sign OR4ISS. 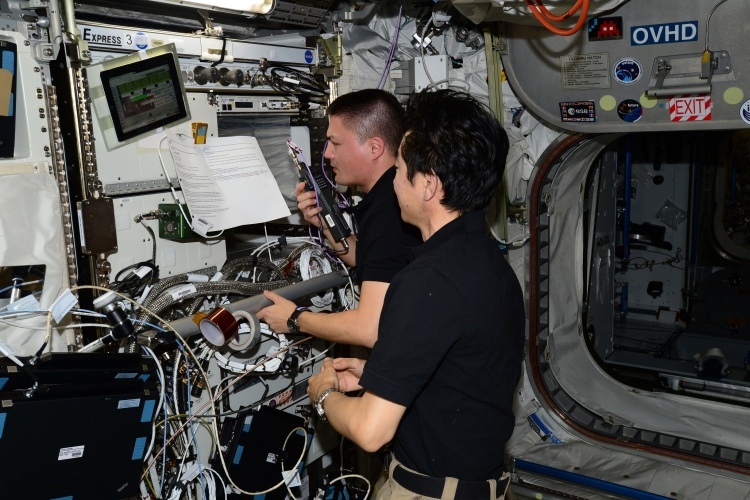 Astronauts Kimiya Yui KG5BPH (front) and Kjell Lindgren KO5MOS (operated the Ericsson transceiver) using the amateur radio station in the ISS Columbus module, call sign OR4ISS. The International Telecommunications Union (ITU) is a United Nations agency, located in Geneva, Switzerland. The ITU coordinates the shared global use of the radio spectrum, promotes international cooperation in assigning satellite orbits, works to improve telecommunication infrastructure in the developing world, and assists in the development and coordination of worldwide technical standards. ITU Headquarters hosts an amateur radio station, with call sign 4U1ITU. For the World Radio Conference, this station uses the special call sign 4U1WRC.